I've been working on these (potential) new designs for the store. What do you guys think? Would you wear either of these? Do you think anyone else would? Any other ideas you'd like to see on a Frockly T-shirt? Love the Dennis the Menace! I think that it is perfect. We will see you at the game today. Yes--I'd totally go for a Dennis the Menace shirt! 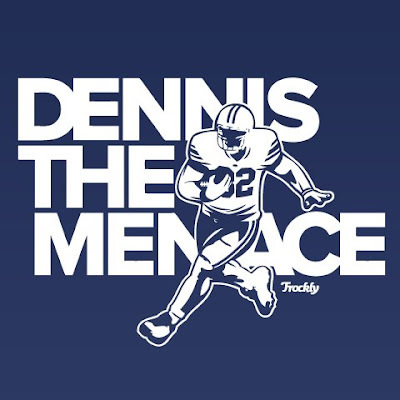 I would totally wear Dennis the Menace. I like Dennis the Menace. The Bronco shirt doesn't do anything for me. i like the bronco shirt and would totally get it. i love the bronco shirt. i would totally vote for him and therefore, vote for this shirt. I think both shirts look great. Since I'm out of BYU country now, I probably wouldn't be as likely to wear the Bronco one unless it said something about byu as well...just b/c people here probably don't know what the shirt means. Like both shirts... maybe you could do a play off of Obama's "change" motto for BYU, Bronco, and the BCS. Keep up the good work! It's nice to have something else out there! 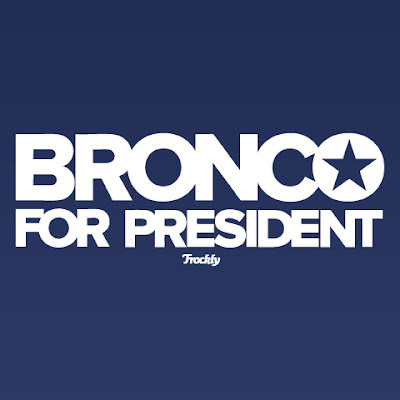 I love the Bronco shirt, I would totally love it! What else with Bronco could you do? I love the Dennis Pitta shirt. I noticed they were off the main page of the website. Are you still planning on making them? Hope so! I LOVE THE BRONCO SHIRT!!!! And I know about 10 other people who would buy them. Please let me know when you come out with it. Like 'em both. I would love to see some sweet BYU basketball shirts.